A "home away from home" to keep alumni connected to the University and one another. Located at 300 East River Road. A University Alumni ID card is required for many campus services. Cards may be obtained free of charge from the River Campus ID office located in the Customer Service Center on the first floor of Susan B. Anthony Hall. For hours of operation, please call (585) 275.3975. Even after graduation, Rochester alumni still have access to the various resources and services provided by the Gwen M. Greene Center for Career Education and Connections. Visit our website to learn more. You can also reach out to the Greene Center via email at career.center@rochester.edu. Many alumni find this the ideal location to integrate the spirit of Meliora into their weddings, memorials, and other events. Space in the chapel is limited, so submit your request today! One visit per month is allowed free of charge for alumni. Please show your Alumni ID to take advantage of this benefit. Beyond that, the University requires visitors to purchase one-day permits at the visitors' booth near the Elmwood Avenue entrance. Note that parking is free between 7 p.m. and 7:30 a.m. Monday–Friday and throughout the weekend in non-reserved spaces. The R Club offers exclusive membership, providing access to the entire complex. Out of town alumni have access to all facilities with a University Alumni ID card and a daily fee. The Athletic and Aquatic Center hours may change periodically to accommodate varsity athletics or special events. Please call (585) 275-7643 with any questions. Make official transcript requests via the Registrar’s office website. Alumni and students will be charged a nominal fee for transcripts, depending on the delivery option selected. Stay virtually connected with the University of Rochester and your fellow alumni. Show your Rochester pride with a Rochester email address! Beginning with the Class of 2015, University of Rochester email addresses remain with graduating students without any action required. For alumni from the Class of 2014 or earlier, you can take advantage of the power of Google and G-Suite (Google Docs, Calendar, Sheets, Drive, and more) by setting up a Gmail account through RAX. To get started, follow these instructions. Please note that students in some programs are provided with email addresses that end in @ur.rochester.edu. If you are currently using an email account that ends in @ur.rochester.edu, know that in most cases these accounts are disabled 90 days after graduation. If you have any questions about your email following graduation, please contact us at alumni@rochester.edu. Don’t wait, sign up for an alumni email address today! Beyond the Genesee: A Yellowjacket's Guide to Navigating Life After College is a searchable online guide for recent graduates, full of advice from experienced alumni. A wide range of transition topics are covered, including applying to graduate school, finding an apartment, preparing for job interviews, and more. The Meliora spirit knows no bounds. Share your school pride no matter where you're living or working. Wear your University of Rochester gear with pride. Check out these online stores and grab the latest looks to display the Meliora spirit wherever you live. Getting married or gathering a group of alumni? The Office of Alumni Relations will send you a University pennant to put some Meliora spirit in the photos for your special day. To receive a pennant, email us at alumni@rochester.edu with your name, class year, mailing address, and wedding date. It's that easy! Hosting a reunion based on a club or organization from your time on campus? Visit this page for more information on how we can help you make your gathering a success. As an alumnus, you have virtual access to several premium library databases. Accessing the premium content (JSTOR, Proquest Alumni Edition, and Sage Journals) requires a NetID. If you don't have a NetID, you can set one up by emailing alumni@rochester.edu with your name—include maiden or former names—address, class year, and school. You will receive a one-time code and instructions for creating your alumni account on the Rochester Alumni Exchange which provides you with a NetID. Alumni are welcome to visit the library and use materials within the library. Those who are not alumni are eligible to purchase a Miner Library Borrower ID card. Borrowing privileges at River Campus libraries are available with the presentation of a University Alumni ID card. This library gateway provides alumni near and far with a rich musical resource. Music educators and musicians within a 50-mile radius of Rochester may apply for a Community Borrower's Card. 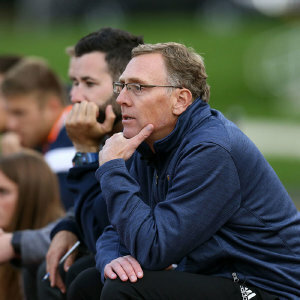 As head coach of the men’s soccer team, Coach Apple is grateful for the opportunity to combine his passions for teaching and soccer at his beloved alma mater. No stranger to soccer success, he thrives on working with self-directed, high-achieving Rochester student athletes.